A common sight in appliance stores and showrooms all over the country, there’s no denying than an energy rating label plays an important role when running an energy efficient home. Choosing efficient appliances can not only help you to reduce emissions from greenhouse gases but also enables you to enjoy cheaper energy bills. Fridges, freezers, washing machine and dishwashers are some of the biggest energy-drainers in your home and it’s beneficial for them to be as energy efficient as possible, but how do you read the labels? 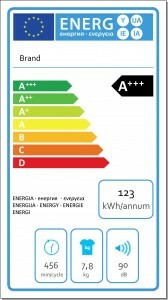 The 7 coloured bars shown on an energy label are to demonstrate the ‘level’ of efficiency that an appliance has been rated. A+++ is the most efficient whereas D is the least, with the rating being primarily focused on energy consumption. 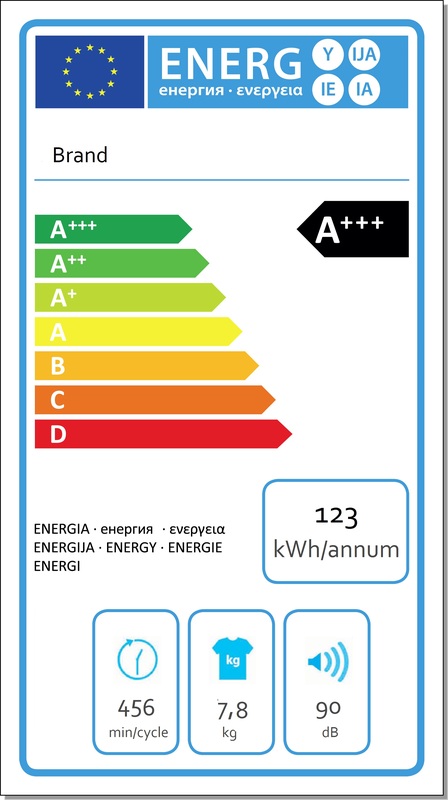 The energy rating label that we have shown is typically used for a washing machine or tumble dryer. This example shows that the annual energy consumption is 123 kWh/year, calculated by the standard cotton program at full and half load. These labels don’t just tell you their energy rating but also give you information about your appliance. Noise levels, water consumption and capacity are also shown to give you a rough idea on what the appliance can manage, helping you to get the best performance from the machine. What appliances use an energy rating label? You’ll probably be seeing a lot of energy labels if you’re looking for a new appliance as manufacturers are legally obliged to display the energy efficiency ratings at the point of sale. If you can’t see one, don’t be afraid to ask for it! UK households spend an average of £30 a year powering appliances that have been left in standby mode. Although it may sound like a small amount, the cost can add up and the amount of energy you are wasting can have damaging effects on the environment through burning unnecessary fossil fuels. Fortunately, there are a number of products that are designed to be super energy efficient and almost eliminate the need for paying over the odds for your energy. Using less = spending less, which is a win-win situation all round! Still confused? Get in touch with the Big Green Switch team today and speak to one of our energy experts. You’ll be cutting down on your home’s energy bills and enjoying the benefits in no time!